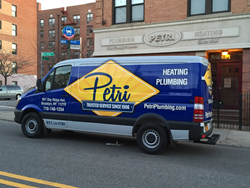 Brooklyn's trusted plumbers, Petri Plumbing, now offering specialized services for steam and hot water boilers. [We] have determined the prime time for repairing and replacing is in the fall, prior to drastic temperature drops. Petri Plumbing and Heating, Inc., a leading plumbing and home service company serving Brooklyn and Manhattan since 1906, is now offering specialized services and tips regarding steam and hot water boilers. In preparation for the upcoming winter season and in an effort to ensure year-round safety, homeowners are encouraged to have pre-season maintenance and repairs performed on residential boilers now. Among the services offered for pre-season boiler maintenance, Petri Plumbing is offering detailed inspections of home hot water heating systems to ensure their safety and reliability. When a boiler fails, it can do so disastrously, putting families at risk. Petri Plumbing’s complete home water heating inspections can identify any trouble spots with a system before it’s too late, and offer guidance on repair or replacement options. Cold air temperatures can present additional issues for boilers as they can become starved for oxygen if the boiler room’s atmospheric pressure drops. Because of this, rooms must be up to code to allow proper airflow and eliminate any chance of the air pressure dropping so low, an explosion occurs. To find out more about pre-season boiler maintenance in Brooklyn or Manhattan, call Petri Plumbing at (718) 748-1254. About Petri Plumbing and Heating, Inc.